This hardy, very drought resistant ground-cover provides reliable, dark green foliage year round. 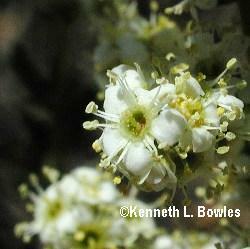 White flower clusters cover the tips of the branches in early summer, providing a nectar source for butterflies. Use this plant in full sun on slopes as an attractive soil stabilizer, or in rock gardens where the dark green leaves look great contrasted with the granite rocks, or in dry borders or beside walkways. Provide well-draining soil and expect growth to stay under 1' in height and 3' -5' spread. 'San Nicolas' is a prostrate selection of Adenostema fasciculatum from San Nicolas Island. Adenostema fasciculatum 'San Nicolas', Prostrate Chamise Photos provided do not match the 1' description. Right plant but wrong photos or wrong description for this plant?